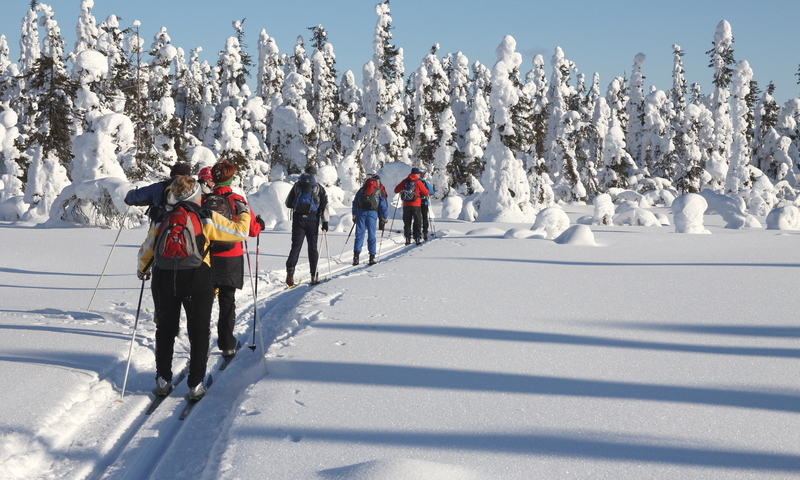 An unforgettable ski trek through the picturesque Pallas-Yllästunturi National park, through the unspoiled wilderness of the treeless Lappish tundra and serene forests. We ski traditional style with a relaxed pace from cabin to cabin and have coffee and lunch breaks in small cabins and Lappish tepees. After a brisk skiing day, we chill out in a bath in a sauna and have a delicious dinner. Some days we stay the night in simple huts and cabins, where the only comforts are a wood-heated sauna, a tasty meal, good company and a warm sleeping bag. We transport luggage from cabin to cabin. On ski track, you need only a small backpack for lunch, warm drink and accessories for that day. Visit a nature information centre in Pallastunturi gives you an excellent insight into the Lappish traditions and nature – flora and fauna. Day 1 – Transportation from Kittilä airport to Rauhala. Overnight accommodation in a holiday cabin or in the rooms for 2-3 persons. Dinner and accommodation. Day 2 – After breakfast, the guide will tell about the week’s program and the first days’ ski tour. We will pack our luggage for the transportation and after that start the skiing tour from Rauhala to Keimiöjärvi and from there onwards to Keimiö. Sauna, dinner and overnight stay. Day trip approx. 25 km through varying woodland. Day 3 – From Keimiö the trek continues to Pallastunturi. At the Information centre of the Pallas-Ounas National Park, we will have the possibility to learn more about the nature of this area, – it’s flora and fauna – from an exhibition and slide show. From Pallas, we continue along the Pallas Fells to Kerässieppi/Raattama. The day tour is approx. 33 km through the forest and fell grounds. Day 4 – Today we will make a day tour from Raattama in the surrounding forest and fell areas. Lunch break at an open fire or in a hut. The day distance is ca. 20 km. Day 5 – This day we continue northwards through the forest landscape to Hannukuru wilderness cabin, where we will have a break. From Hannukuru we continue our tour over open fells to Hietajärvi lake and Pippovuoma swamp. After crossing Ounasjoki we will reach Ketomella and our wilderness cabin. The day tour is approx. 31 km. Day 6 – In the morning we ski to the wilderness hut of Sioskuru, and continue along the Pyhäkero Fells to the wilderness cabin in Pyhäkero. After a break, we ski onwards to Hetta. The day trip is approx. 30 km. The landscape is wooded and open fell ground. In the afternoon transfer by bus to Rauhala. Day 7 – We will do a day trip from Rauhala in the surrounding area. Lunch break in a teepee (kota) on the open fire. Day distance 20 km through varying woodland. Day 8 – Breakfast in Rauhala, departure. To participate in this tour, you should have earlier cross-country skiing experience and be able to ski 5 km/hour in varying terrain (on track), max. 35 km/day. Accommodation for the first night and two last nights in the base camp Rauhala in holiday cabins or room for 2 persons. During the tour, accommodation is in wilderness huts and holiday cottages in rooms for 2, 4 or 6 people. Most of the cottages have electricity and running water. Sauna is available every evening. If you rent skiing equipment package from us, you can use your own ski boots with Salomon SNS Classic – bindings.